A study was commissioned by Gwich’in Council International and carried out by InterGroup Consultants, with support from Lumos Energy undertaken to segment and measure the costs related to diesel electricity generation in these non-grid areas. 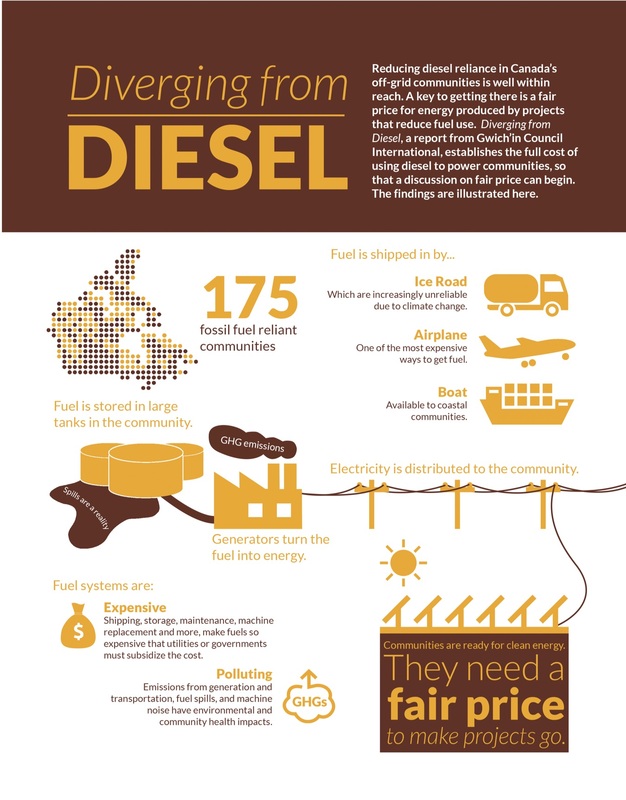 External social impact costs resulting for a reliance on diesel fuel. Focusing on a transparent analysis of the full costs of diesel generated electricity in northern off-grid communities, the study utilizes utility-supplied rate filing documentation provided to governments and energy regulators by utilities; government carbon tax costs; and research related to the direct and indirect social costs associated with the use of diesel for electricity generation and building heating purposes. Information was gathered on 9 northern, off-grid communities in the Northwest Territories (3), Yukon (2), and Nunavut (4). Pembina Conference (October 2017, Whitehorse): https://www.bullfrogpower.com/communities2017/2017-day2-Grant-Sullivan.pdf. Arctic Summer College (August 2018, Online): https://www.youtube.com/watch?v=otj2rrn20O8&feature=youtu.be. We would like to thank the Circumpolar Affairs Divsion at Indigenous and Northern Affairs Canada for thier financial support of this proejct.